It’s taken me so very long to get started on this one, even though I bought most of the timber (all PAR; 94mm x 44mm Scandinavian joinery-grade redwood) back in October(!). It’d been hanging around my workshop for far too long and all those 2.1m lengths were constantly getting in my way when I fitted those ceiling joists back in February. One mistake I did make was to ask for PTGV boards without giving any consideration to the thicknesses they might have available… A few months (!!) 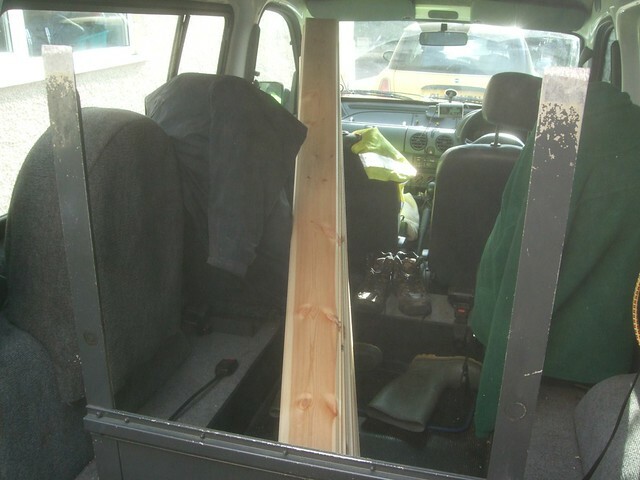 after purchasing the timber, I realised that these boards were only 16mm thick (approximately 5/8in). 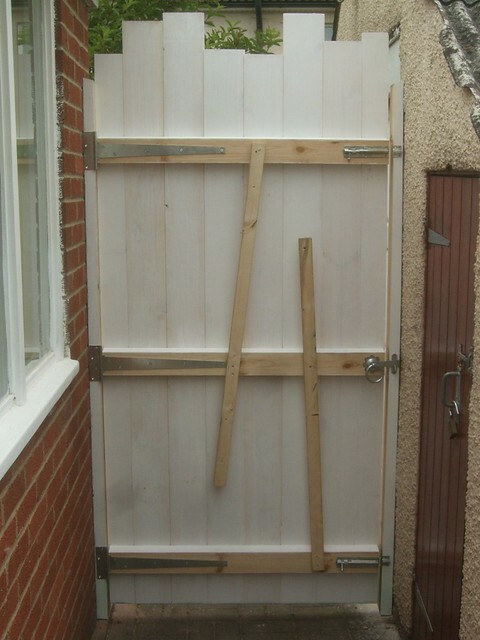 Now, while some make think this is reasonable, I have my doubts, as this is a gate with a simple ledge-and-brace design (no surrounding frame) and, the thinner the boards are, the greater the chance that they will move and distort through seasonal changes of humidity and moisture content. 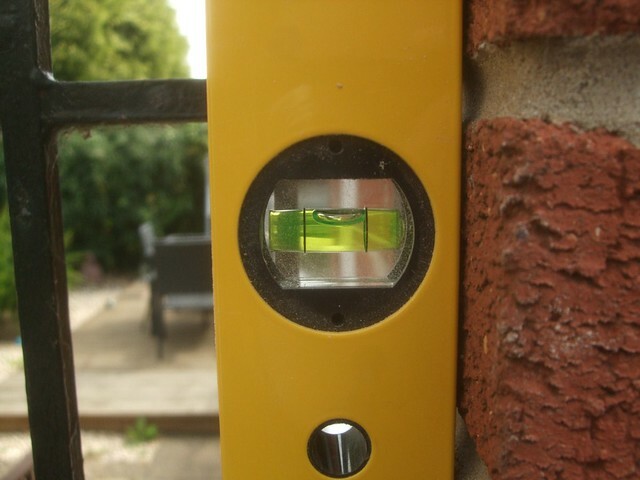 This gate’s dimensions are determined by the distance between two walls, minus the combined thickness of two wall plates (44mm + 44mm) plus an allowance (12mm ~½in or so) for fitting of the T-hinges. This one is going to replace a horrible metal-thing. Not only is the paint flaking in many places but, it lets a lot of wind through. Therefore, the gate will stand at 2m tall. That’s not a problem. However, there are two other factors that do bother me – one is that neither wall is perfectly plumb (vertical); the other is that the wall on the ‘closing’ side (with its pebble-dashed finish) is actually convex and means the timber would not sit flat against it. So, the original opening for a gate measures almost 1in wider at the bottom than the distance across the top. So, before I do anything else (including assembly of the gate), it would be best to scribe each of the wall plates to fit each of the two walls. 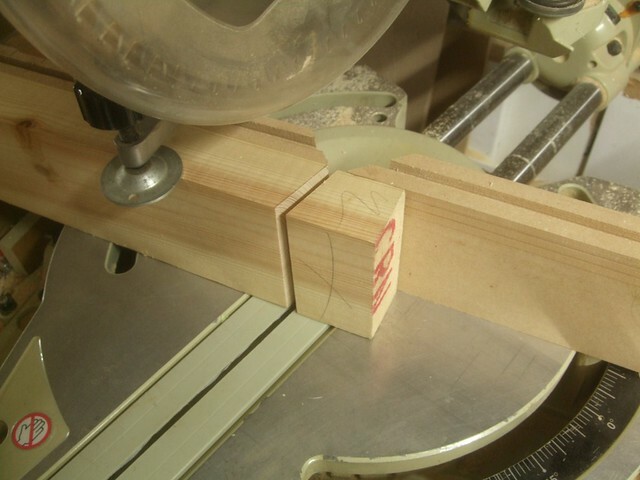 Planing or tapering something almost 4in wide (94mm) wouldn’t be easy. 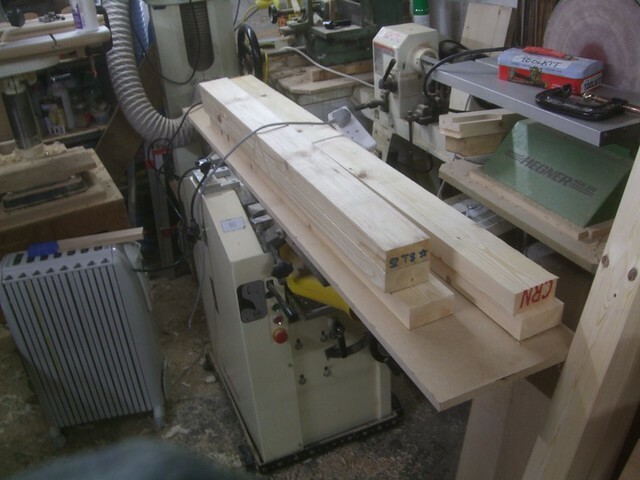 Even my power planer will only cut to 82mm in width and, if I was doing this job ‘on-site’, so to speak, I wouldn’t have the luxury of a 16in bandsaw next door! On the UKworkshop forum, I received an excellent reply to my plea for advice. 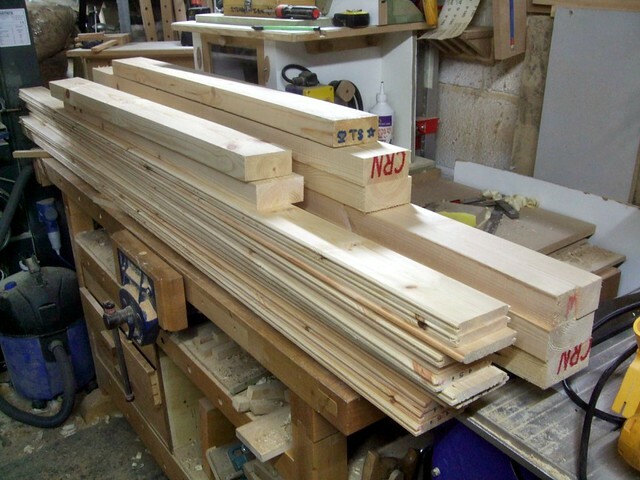 JasonB suggested that, in order to remove much of the donkey work in scribing these timbers, I should plough (using a router) a wide but shallow groove down the rear face of each wall plate. 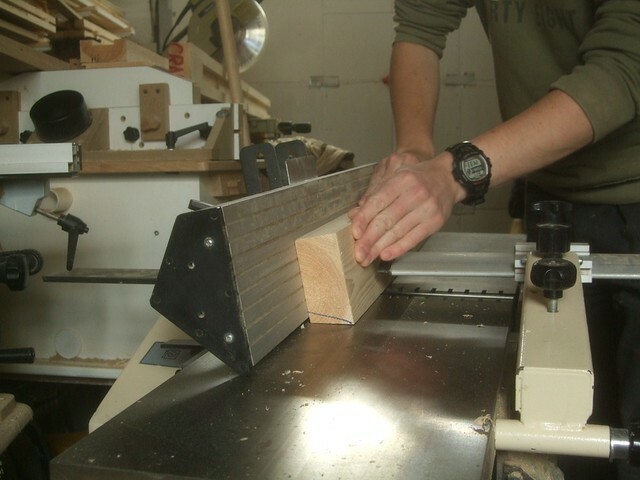 This leaves you with only two narrow sections to plane or, you could even cut them with a jigsaw. You do have to scribe both edges, using this method but, it’s a very small consequence for a huge saving in time and effort. You’ll also notice that I’ve treated these grooves and the first 6in or so of the timbers with an end-grain preservative. I do believe that full pressure-treatment is unnecessary in many exterior situations, provided that the timber is regularly maintained and looked after. It’s on in direct damp or ground-contact situations where we should really be so concerned – in my opinion, of course. At the top of each wall plate, I cut a 15° bevel using my sliding mitre saw. 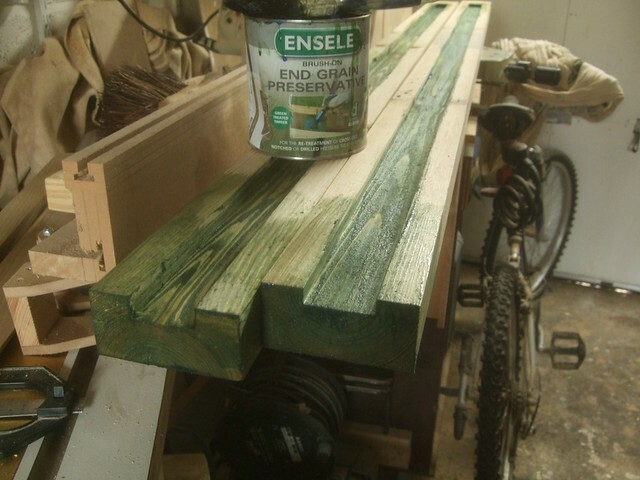 This should prevent water from easily seeping in to the ever-absorbent end-grain of this softwood. 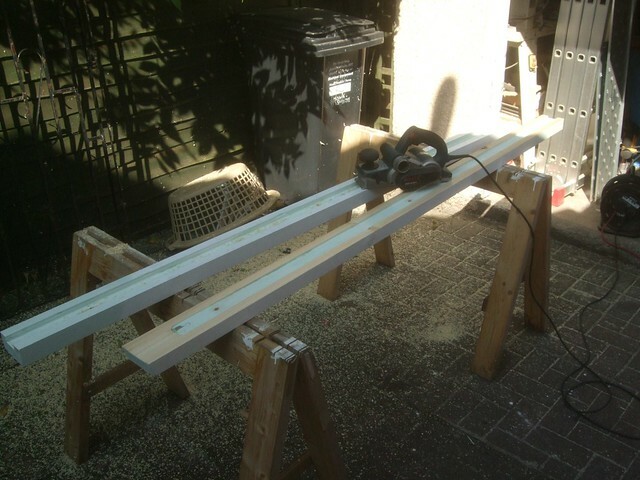 Another step I took, prior to the assembly of the gate, was to bevel the top edges on each of the three rails at 10°. Again, this should allow water to run off, where too many other gates allow it to collect and wear in to the back faces of the main boards. This was a situation where I would need to finish the opening before I could begin making the gate to fit in it. It might sound ‘backwards’ in this scenario but, if you were making a high-quality cabinet in oak or mahogany, you wouldn’t make the door first and then, after sweating over the carcase, hope that it all fits perfectly, would you… One week prior to the initial stages of installation, I coated all (well, most of!) 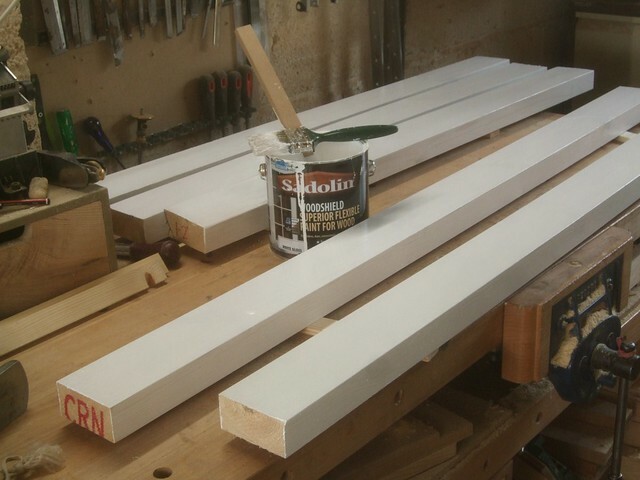 surfaces with a single coat of Sadolin Woodshield – which, rather confusingly, is also known as Superdec to trade buyers (which, in itself, should not be confused with the satin-finish paint… This is most certainly a water-based gloss.). It’s not the cheapest on the market (it is available from Homebase) but, it’s very highly regarded amongst professionals as being something that will last. Sadolin also claim that this can be used on top of old and weathered paint finishes, without the need for a complete removal and clean. So, I am looking forward to see how well this paint will last throughout the coming years. Removing the old gate (which was necessary before I could insert the new frame) proved to be quite a challenge. I was surprised at just how heavy that old lump of flaking metal was and yet, it was held in by a small number of screws (each of which had seized up with rust!) barely an inch long, if that. 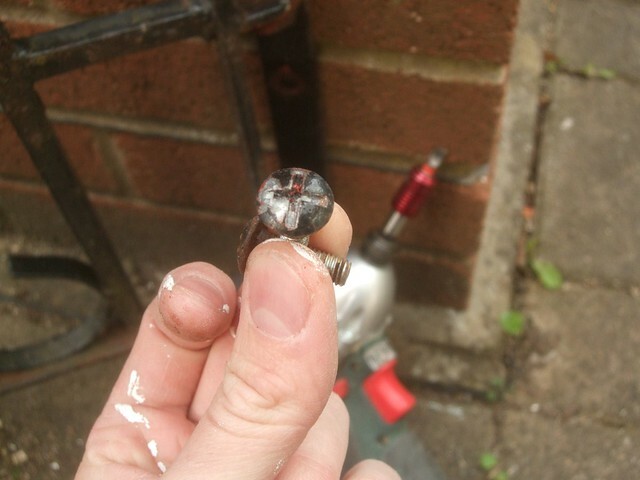 I soaked each screw liberally in penetrating oil before using my 10.8v impact driver (with care!) to work them loose. This worked well for all but one of the screws, thanks in part to the large roofing bolt-like heads, for which I didn’t have a perfectly-suited screwdriver bit. In the end, I had to drill the head off, lift the gate away and then break the protruding thread of with a hammer and cold chisel. Scribing, planing (with my Bosch power planer) and fitting the two wall plates proved to be relatively simple, thanks to Jason’s great advice. My initial mistake was to stop the grooves short of the tops, so that water could not fall in to the void behind – but, as some of you may have realised earlier on, it was actually from the top where I needed to be removing the most material, in order to true up the width of the opening. I’m very pleased to say that the opening finished only 3mm out after all this work – sure, it’s not perfect but, in this kind of situation, that’s one tolerance that I am very happy to work within! My dog came along for the day when I got on the bulk of the work. 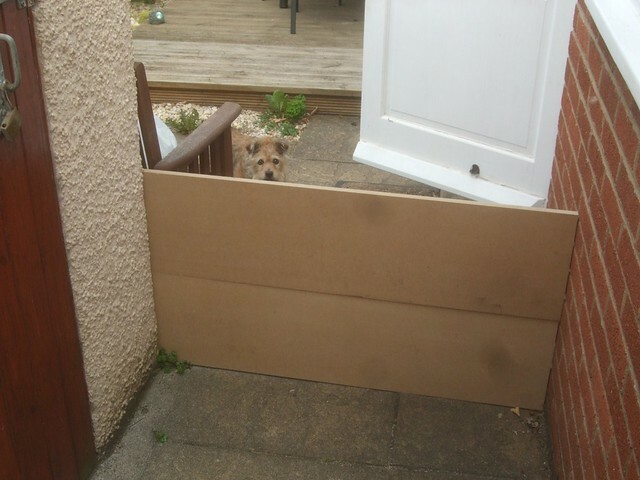 In the mean time, with the old gate removed and a lively small dog who’s always curious to know what’s going on, I had to construct a temporary barricade so that she could not break free. Thanks for reading. Look out for part two. Nice gate. I actually think the ‘Flintstones-style top’ looks quite cool. 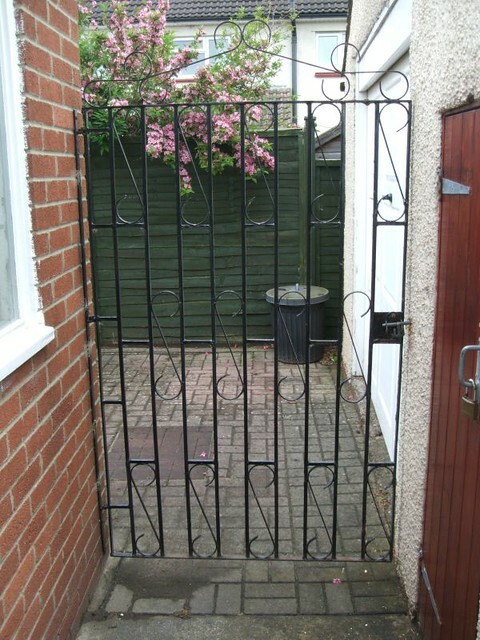 And the gate looks to fit really well. Looking forward to the next part.